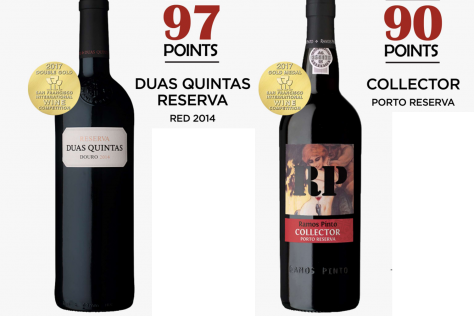 The Port House of Ramos Pinto produces Duas Quintas, exceptional red table wines from the Ervamoira and Bons Ares vineyards in the Douro region of Portugal. Founded in 1880 by brothers Adriano and Antonio, Ramos Pinto is still run today by their heirs, João Nicolau de Almeida and Jorge Rosas. João Nicolau de Almeida, the enologist, has been responsible for conducting research which eventually designated five official native varietals recommended for the Douro region: Touriga Nacional, Touriga Francesca, Tinta-Barroca, Tinto-Cao and Tinta-Roriz (Tempranillo). He also introduced the vertical planting of vines in the Douro. Acquired by the House of Louis Roederer in 1990, Ramos Pinto cultivates 187 hectares of prime vineyards in Portugal’s famed upper Douro region. The vines grow on steep, rocky slopes rising at 30° to 70°. These seemingly difficult conditions are actually favourable to the vegetative cycle of the vine and perfect maturation of the grapes. 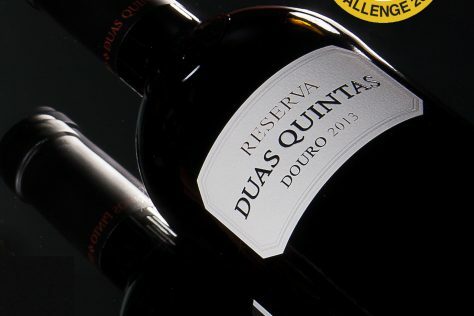 The wine for the Duas Quintas red is a blend of Touriga Franca, Tinta-Roriz and Touriga Nacional grapes from the Quinta de Ervamoira and the Quinta dos Bons Ares. The Duas Quintas Reserva wine is a blend of mostly Touriga Nacional with a small proportion of Tinta Barroca. Ervamoira lies in a rocky area on the banks of the river Côa where the weather is hot and dry. This adds density and body to the finished wine. It was the first quinta in the Douro where, in contrast to tradition, individual vineyard blocks were planted with a single variety, selected for the grape’s most appropriate soil and climate. Bons Ares is a granite vineyard of higher elevation with cool growing conditions, adding freshness and vivacity. The Reserva wines are aged for six months in new oak casks. They are then bottled at Quinta dos Bons Ares where they mature for another two years. The Duas Quintas line of wines are full-bodied, full of fresh fruit (mixed berries, plums) and possess excellent tannins that provide structure and a long finish. They can be drunk young or aged for two or three years and are a great value and outstanding with food. Pale with light gold-green reflections. Aromas of lemons, herbs and white flowers finishing with a slight spice. A dry palate with hints of ripe golden fruit and a lemon finish. Clean and bright, very pale with light gold reflections. Aromas of sweet fruit, melon and grape with floral notes of roses and white flowers with a final hint of spices. Deep, intense dark garnet. Open and appealing aromas of dark red fruits with undertones of toasty oak and wild herbs. Full bodied, with concentrated dark fruit flavours and a spicy intense aftertaste. Its fine structure and length ensures further development over the next five years. Very dark red, the aromas combine dark plummy fruit with herbs and a hint of spice. On the palate generous fruit, a supple texture and bright fruit on the finish. 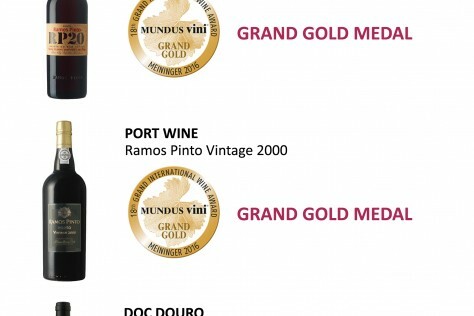 Gold and Grand Gold for Ramos Pinto’s Wines!